I am so impressed with you writings on what we have been doing so far and your illustrations are wonderful. Yes, Yessenia, you all are smart cookies! (As her illustration so cleverly depicts!) Just think what we have accomplished in these first few months. I am sooooooooooo proud of our group of bloggers! Good thinkers, good writers, good citizens - plus much, much more. It's exciting to think where we will be by the end of the year. I am going to post about you on a special weblog as well as my own. I'll share next year when we all return from vacation. I wish you all a very warm and wonderful holiday season. I can't wait to see you next year! Kudos to Estefany! 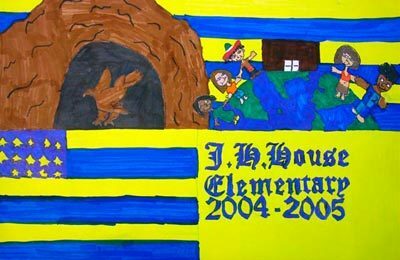 Her picture was chosen to be the cover design for J. H. House's yearbook this school year! Wow! We have an artist in our midst! I am so tickled for Estefany! Not only does she have artistic talent, she is an up-and-coming writer, too! I wanted to post her design for others to enjoy! Way to go, Estefany! Wow! What a wonderful day! We started the session with some outstanding dialogue. We collaborated about writing, blogging and learning. I think the best times are when you share your thoughts, ideas and views. I am amazed at your potential. I am so proud of you and everytime we have these good discussion opportunities you ALWAYS exceed my expectations. You have such terrific discussions and Ms. Meeler and I learn so much from you. Blogs really are great places to use to describe what works for students in their learning and who better to hear from then students themselves. I wish every student could do this. The discussion began with talk about what you are studying in your classes, how you feel about blogging, writing, and just learning in general. What I did hear loud and clear was that you like having a choice about what you choose for a writing (blogging) topic. You like that you can reach out to others outside your classroom and you have a handle on what you need to do to improve. So that's where we're heading! Ms. Meeler's hands were moving like racecars on the keyboard as ideas, suggestions and thoughts filled the air in the lab. Everyone got a chance to participate. I have to complement you on what good listeners you are! You really are respectful of each student who had the floor. You listened, thought about it and then added more to the conversation. You did it in a way that allowed us all to absorb a special moment of learning. The dialogue was stupendous! What give and take as you all made connections with what your classmates said. I'd say the classroom was alive with engaged learners. Ms. Meeler typed your ideas into Inspiration. Isn't she fast? I've heard it said that she is faster than a speeding bullet in our technology labs! She captured all of the good ideas that were flowing around the room. You all have a desire to improve your vocabulary so we focused on words that we want to not overuse so we will learn more synonyms.And it was mutual consent that students would no longer say they needed a more better word! Good going! Hey, they say a picture is worth a thousand words so let's use them to show others what was on our mind today. Click on the graphic to enlarge it and prepare to be dazzled! Here goes! Next you all opened a new document in Inspiration and began to summarize our discussion. 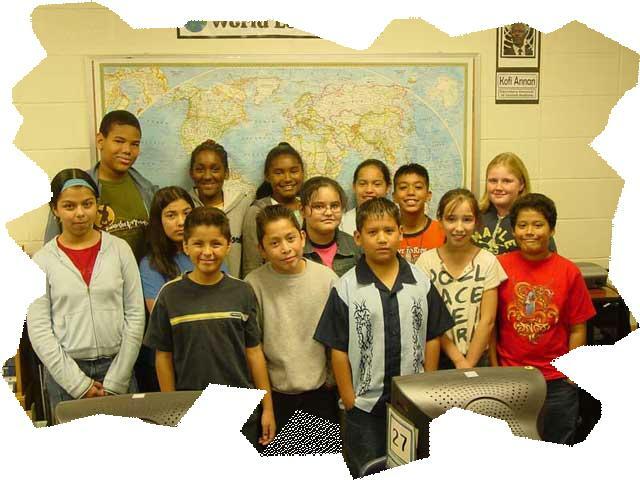 Then papers were printed and we printed our class documents which you reviewed and put in your folders. Then the blogging began! Now, we have to have more time for this so we didn't get our writing completed today. That's OK - we will continue next week. We didn't get to comments but we did manage to squeeze in time to learn about the Search Tools and you all found a link to an article about writing that seemed worthwhile to add to your folders. We'll get back to searching a little later. As promised, I gave you time to explore some of the learning games on the current events links, play some vocabulary games or another activity of your choice. I have to enclose a couple of quotes from your blogs. It tells it all! If someone came up to you and asked you what weblogging was, what would you say? I would say exactly this. Weblogging is when you can have the freedom to express yourself, and write about whatever you want to! You have to be careful when you write because you could be writing in front of the whole world! Have you ever tried out to do weblogs? If you haven’t, you should try it out. Ever since I began weblogs my writing has improved. However, I still need to practice on some things. Punctuation is one that I have mastered. Organization is one that I have not mastered. I have done a better job writing because I use my personality in my writing, I include my voice in my writing, I use many of my choices, and I have freedom over my writing. Aw my brain hurts! Do you know why? It is because of all the learning in the weblog group. Oh yes, tomorrow Ms. Meeler and I are going to do an inservice with DeKalb County teachers. We can't wait to show them your blogs!!!!!!!!!!!!! Did you know that writing can be used as a tool for learning? a tool for convincing? a tool for thinking? a tool for communicating? a tool for many engaging-type activities? Yes, writing is hard work but the reward of seeing your thoughts take form into a good "think-piece" is fantastic. You know, I've had lots of questions in my head lately about you. Guess what! Often my own questions lead me to writing a post that helps clarify my thinking. 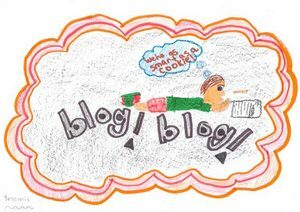 In a previous post, I attempted to answer this question: Who says elementary students can't blog? Now, I know you do even more but my point is that I was telling a story to answer the question that I had used for the title of my post: Who says elementary students can't blog? It helped clarify my thinking and and at the same time let me share what we are learning with other students and teachers. Isn't that amazing? Now you think of a good question that revolves around something you are learning, something you think would be worthwhile to share with others. Think of a good question that you could ask so you can write an thoughtful piece to share with others. Think of a question that would engage others to think about what we are learning and then maybe even add ideas to help us learn. Ms. Espositio and Ms. Lee arrived in our classrooms today, complete with cameras and tripods! They were the visitors I had posted about last week. Ms. Esposito had contacted me about doing an inservice for technology teachers in her school system. They are Instructional Technology Specialists from DeKalb County. They wanted to see you blogging and I want you to know that Ms. Meeler and I were so proud of you! You came in and began your search for an interesting current events article and as they filmed and even interviewed several of you, you were absolute pros! Your answers were thorough, well thought out and I think you painted wonderful pictures in their minds as they moved about the room. Meanwhile I was doing a quick overview of your homework. Again, did you see me smiling? Many of you had made great strides in your writing. I saw more content, better vocabulary, good flow and very interesting topics. You read comments you had received and responded. Then you began clicking away as you traveled from blog to blog making comments to former teachers, peers and even the principal! I noticed that some of you were using comment starters and some had created your own quality comment starters! That was exciting to see! Keep it up! Next I read my post from last week. Discussion followed. Download common_proofreading_symbols.doc were handed out and you swapped homework papers. Using your special proof pens, the marking began. Shelby noted that it was difficult to have to look at the proofing paper and then mark as she was used to marking her papers in her own way. We talked about the importance of having a standard marking system that we would all use so we could quickly do editing in a way that all understood. Ms. Meeler and I understood her concerns! We felt the same way when we were proofing last week. Remember though, if you have suggestions for the proofing sheets, let us know. It is a work in progress. You all went right to work posting your article. Since we had to go into TypePad to actually get to the editing part, I asked for a show of hands to see who could review that procedure for the class. About half of you raised your hands so I asked those who had raised their hands to travel quickly to a friend to review the process. Funny thing, each of you told me that your friend already knew. They were just too shy to respond. I was amazed but pleased all remembered. Another thing to remember, it is OK to make a mistake. That's how we learn and we're a team who respect each other, want to help each other and learn together! So, dare to take a risk! It's OK! Our visitors kept filming and even interviewd Ms. Meeler and myself. They told us later how much they enjoyed seeing what you did with weblogs. I'm looking forward to meeting with them again next week along with the other teachers from DeKalb County. And guess what, they are going to share a copy of the film with us so we, in turn, will share with you! That will be so cool! We will see if we can share parts of it on this weblog. I added one piece to your homework. I printed out one of your weblog pages and you are going to practice proofing that at home. Practice makes perfect! Here's a couple of quotes on writing that I want you to think about. For the writer, there is nothing quite like having someone say that he or she understands, that you have reached them and affected them with what you have written. It is wise to write on many subjects, to try many topics so that you might find the right and inspiring one. Now, here's one for you to ponder. It's how Ms. Meeler and I feel about you.